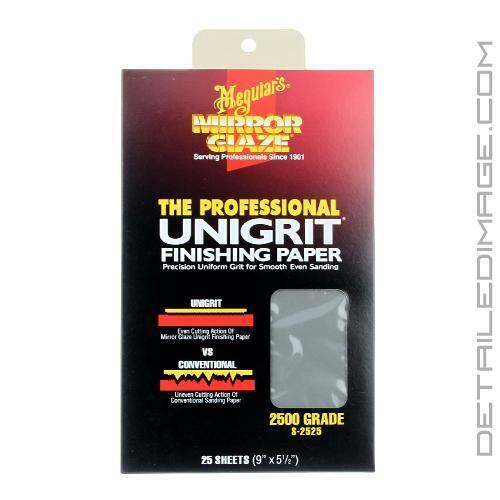 Meguiar's Unigrit Finishing Papers are used by many professional detailers and body shops. Sand paper comes in handy for detailers when performing touch up work, removing deep scratches and imperfections (such as etched water spots or bird droppings), removing orange peel, and restoring oxidized and faded headlights. Ideally, you want to soak the sand paper overnight in water to help achieve the most uniform finish. Lubricate the surface with a mixture of shampoo and water in a spray bottle. Sand in one direction, do NOT use a swirling motion. We always recommend starting with the least aggressive sand paper and working your way up to a more aggressive paper as needed. 2000 grade sand paper is a good starting point to assess how deep the imperfections are. This can usually be polished out cleanly by most medium cutting polishes. The higher the grade you use, the easier the sanding marks are to get out. The lower the grade, the more aggressive the sand paper is. Please note, the box is shown in the picture to designate what grade sand paper is being offered. No box is included unless you order a quantity of 25 for a single grade. Use Ungrit Finishing Papers to remove deep scratches, "orange peel", water spots, acid rain etching and other serious defects. Always use the least abrasive (highest grit) sanding product possible to do the job. Surface to be sanded should be in the shade and cool to the touch. 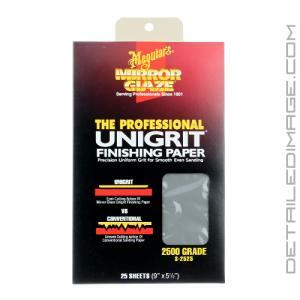 Ungrit Finishing Paper should be soaked in water for at least 15 minutes prior to use. NOTE: To increase lubrication significantly, add a small amount of Mirro Glaze Hi-Tech Wash to soaking water. Change the water often to avoid picking up contaminants. Always sand in one direction, and confine sanding to the immediate area of the defect. Spot check your progress every 12 to 15 strokes. For best results and minimum buffing time, always use the least aggressive grade Mirror Glaze Ungrit Finishing Paper to do the job. To complete the repair, remove sanding marks with a Mirror Glaze cleaner. Follow with an application of a Mirror Glaze polish to restore gloss. For lasting durability and protection on cured paint, use a Mirror Glaze Professional wax. Good for color sanding before buffing.... works..